So, I've been working on a Knight House for about a year and a half. It started as just one Knight to fill out a War Convocation, then I picked up a second more recently, and of course the Armigers in Forgebane. 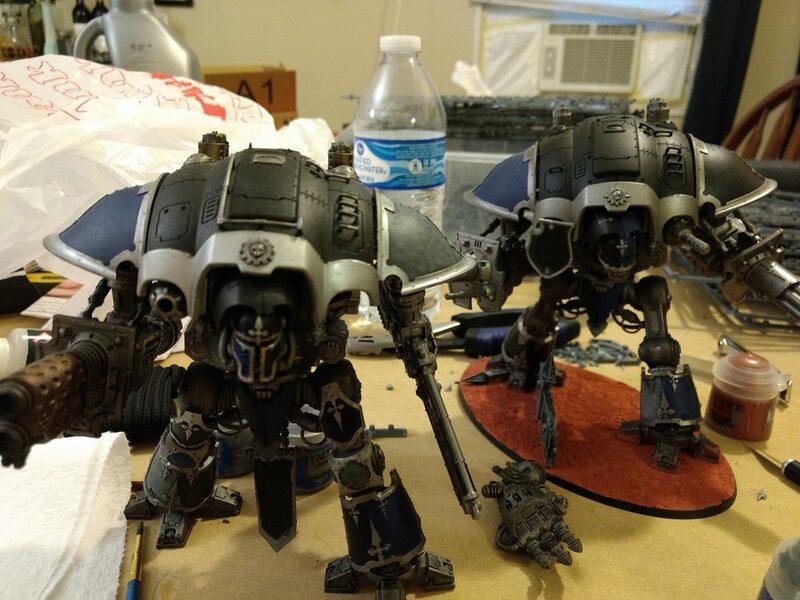 Now I'm picking up a Castellan and two Helverins this weekend, and another Questoris class knight next month, so it is time to make a thread for my progress. 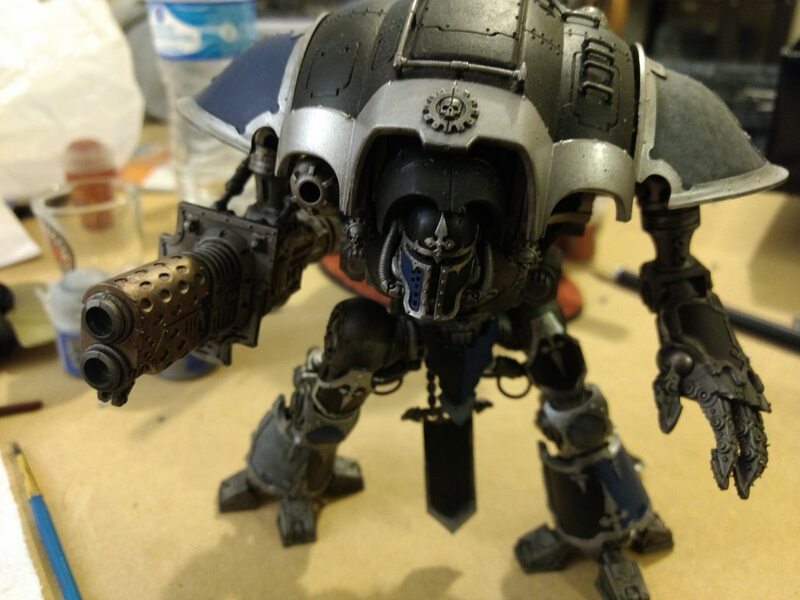 I never made a House because originally they were just going to be subservient to my Forge World, but as time has gone on I'm more interested in the Knights than the Forge World. House Sartoris was a large house before the Imperium found them. They joined early in the Crusade and earned significant glory in the name of the Emperor. However, during the Horus Heresy they lost most of their number. Their past glory was forgotten and they were driven nearly to extinction. In desperation, they made a deal with a Forge World that would keep them alive but kept them subservient. Over the long centuries they became more complacent and obedient, though their numbers grew. Their colors were replaced, the Knights renamed, their past almost entirely forgotten. In recent years, the Princep's heir Johann Sartoris began challenging his father on this matter. He was quiet at first but grew more brash over time, insisting that they deserved to retake their place as a crusading force in their own right. This came to a head with a Knightly duel to silence Johann once and for all. While he lost, he didn't die, so he was exiled. Johann wound up in a mercenary group and over a few years took over. His augmetics and natural talent made it seem only natural for him to make his way up the ranks, and a few timely accidents to other leaders helped. He took his men back to House Sartoris, feigned repentance and begged forgiveness and another chance, having now learned the error of his ways. He was allowed to return alone for an audience while his father and family judged him. Once he was admitted into their fortress, he made a deal with a Sacristan who had agreed with him. If the Sacristan would lower the fortress's shields, he would be chief Sacristan very shortly. He complied, the mercenaries teleported down and helped Johann take over without having to duel his father again. Johann kept his mercenaries around because they had become fiercely loyal to him over their campaigns together, serving now as the house guard. They refer to him not as Princeps, but as "The Colonel." Johann then waited for the right time to "renegotiate" with the Forge World they had served for so long. When they were embroiled in a battle with an Ork Waaaagh and needed support, Johann took almost the entire house with him, repainted in their old colors. They overwhelmed both the Orks and the AdMech forces, sinking their teeth in to show they could, and formally broke ties with them. The Forge World wasn't happy about it but doesn't have the resources to do anything about it. Here's some pictures. I've had very little hobby time lately but I've made a little progress. Picture quality is poor, I'll try to get better pictures later on. There's still a ton to do but I'm happy with my progress thus far. Everything is magnetized. I'm naming the Knights after William Faulkner's writings, but I haven't decided yet which is which. The color schemes look good. 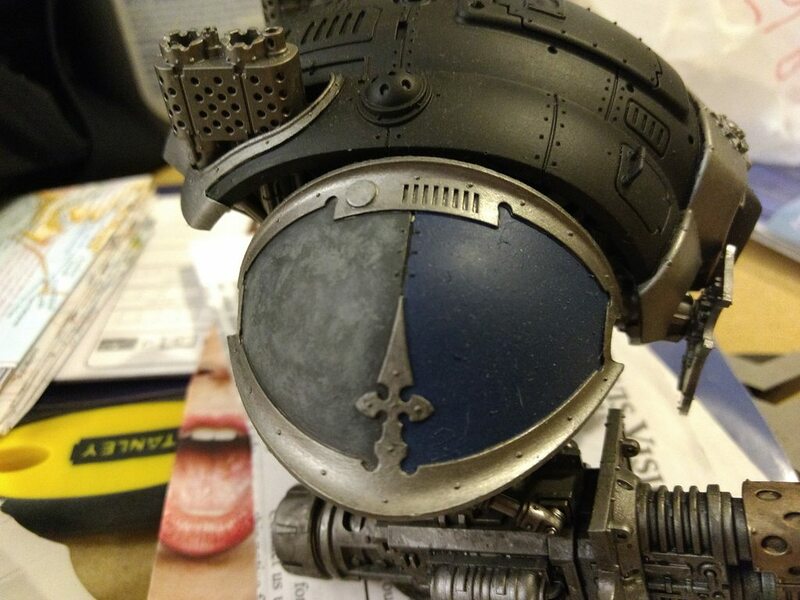 Is the mottled gray half-pauldron meant to represent storm clouds? Thanks! Yeah, it's the skies of their homeworld. Originally it was just plain gray but I didn't like it, I tried the stippling because it looked good on Winters SEO's AdMech, and immediately found it to be an improvement. Seems like these models will never end! 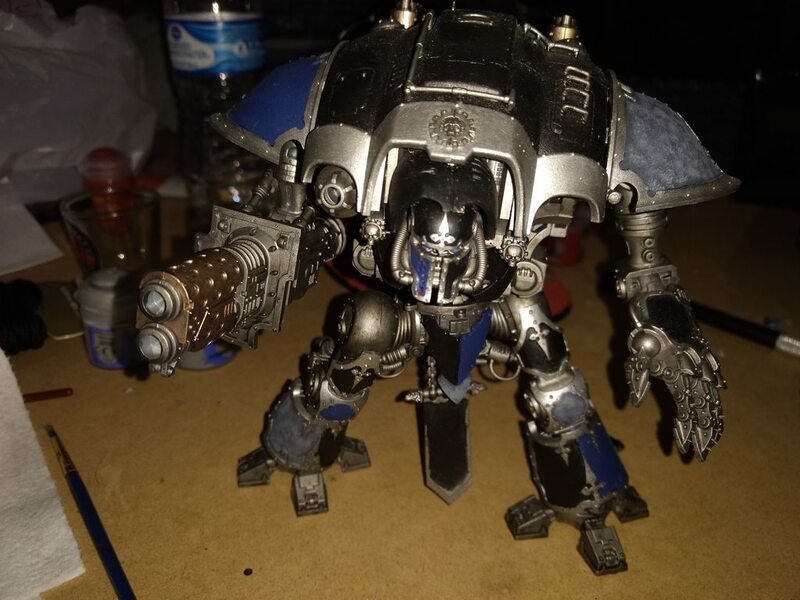 So, I picked up a Castellan this morning, got him built (armor plates aren't on yet but I'll prime everything before I do that). Right as I was finishing my wife surprised me with a Valiant also. The Valiant still needs weapons but is mostly done. Hopefully I can get that finished tomorrow and get my Helverins built also, then get all 4 primed plus my warglaives (built since Forgebane came out, but never primed). Good woman! 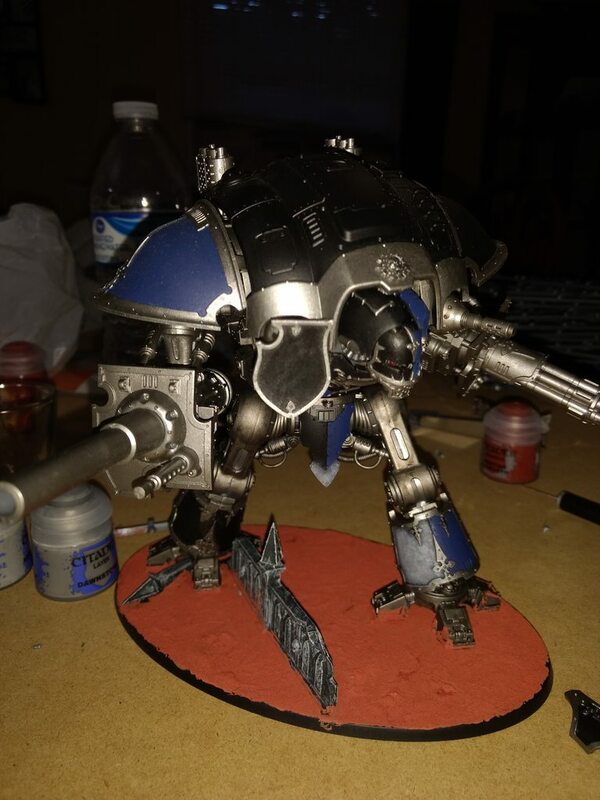 That's quite a cool gift to be surprised with a new knight! Luckily my wife tolerates my hobby as well. Since my boy has become interested she's even happier. 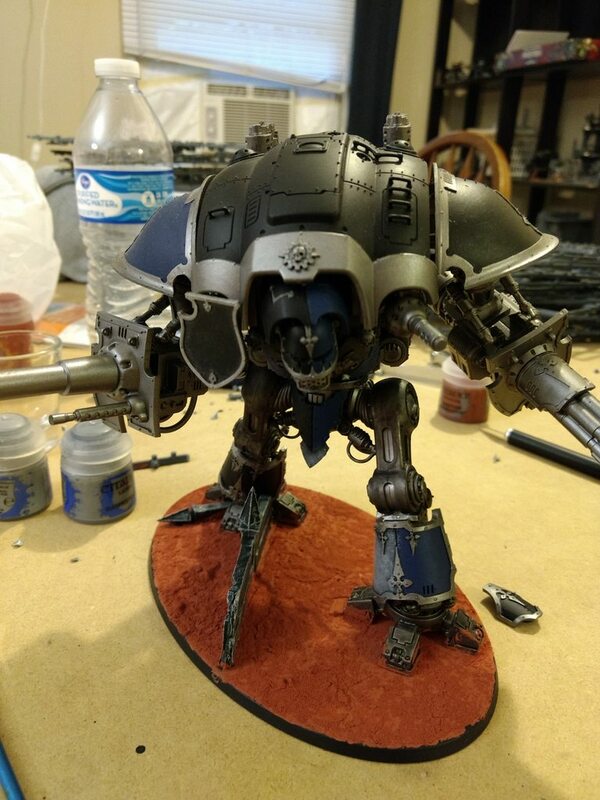 I primed my Castellan, which I'm naming Vox Furioso. The Leadbelcher spray covered it very poorly, though; it completely lacks luster. Im not sure why. So, now I'm brushing over the entire thing with regular Leadbelcher. As a result, it's slow going. I was hoping to get started on the plates today, but at this rate that might not happen this week at all. That’s funny. That’s exactly what I thought of as soon as I saw it. Looks great with the blue contrast too. Like the colours, very brooding! I used his stippling tutorial on my Knights too...! It really is a bafflingly easy way to add texture and depth to the models. I didn't want to change my scheme but I knew something was missing so I tried it and I'm very glad I did!